Marina Fridman (born in Russia) is a Canadian multi-media artist. 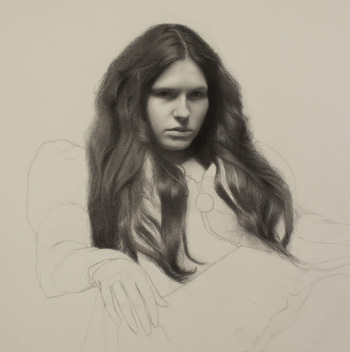 She studied at the University of Alberta and Los Angeles Academy of Figurative Art before receiving her Bachelor of Fine Arts Degree from the Pennsylvania Academy of the Fine Arts (PAFA) in 2014. Upon graduation, Marina was awarded Residencies at the Vermont Studio Center and The League Residency at Vyt on full scholarship. Fridman has received the prestigious Elizabeth Greenshields Foundation Grant, as well as several scholarships from PAFA. Her work has been featured in publications such as Poets and Artists Magazine, Strokes of Genius, and Art Journey. Her most recent exhibitions include Drawing Discourse: 6th Annual Exhibition of Contemporary Drawing at the University of North Carolina Asheville, and Nature Inc. at the Rockland Center for the Arts in West Nyack, New York. I am fascinated by what cannot be seen but can be so palpably felt. Often when I walk into my apartment, it is as though I encounter everything that has happened in the time that I have lived there. Experiences thicken the air, and are embedded in the walls. A previous apartment at times felt like a sanctuary, while at others an asylum cell. My work explores the hidden life of these interior spaces as well as my own internal life, questioning which is more "real": the physical reality that is seen, or the ineffable that is felt. I create drawings, mixed media paintings, sculptures and installations. The drawings depict interiors in which I have lived, simultaneously creating and breaking the illusion of reality and space. The focal point is often a window or doorway - a portal meant to lead you somewhere. Yet in the drawing this focal point remains the white of the paper: in essence the focal point is "nothing". I think that "nothing" is often the most important thing, and suggest in my work that perhaps the physical is merely a facade, a vessel to an indefinable, incomprehensible depth. My most recent works are sculptures exploring themes of decay, transformation and rebirth. The impulse for the sculptures came from the questions: If one could step out of time and view an entire cycle of life at once, from birth until death, what would it look like? How can these processes be depicted simultaneously in a motionless sculpture? 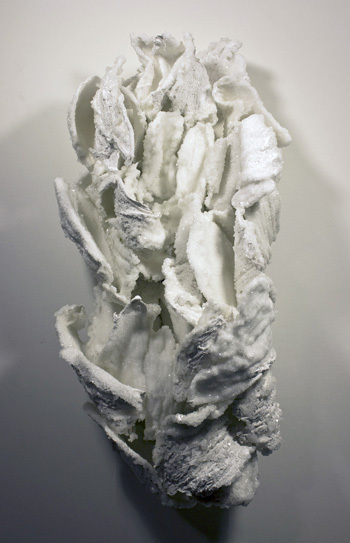 Created by growing sodium tetraborate crystals on textures made of plaster gauze, the beautiful and the grotesque are juxtaposed, causing the viewer to question whether the organic form is blossoming or withering, opening up or closing in on itself. No matter which medium I use, a unifying factor of my work is an exploration of light. The dual nature of light fascinates me: Because it allows us to see form, it is a crucial way that we experience the physical world. Yet at the same time, it can be one of the most ethereal and ephemeral elements of our existence. I wonder where is the point when light transitions from showing us the physical world, to becoming an intangible, metaphysical experience. This page will serve as Manifest's MAR document for Marina Fridman's Residency. We will occasionally update it with news, studio pictures, and works made while at Manifest. The images pictured at right are a sampling of those submitted with her application.